The Bay of Dublin spreads out into a noble expanse of water to the eastward of the city; its shores are agreeably diversified, and present all the various features, from the rugged and severe to the soft and smiling, in landscape-scenery. From the northern shore of the bay we obtain a most interesting view of its extensive surface, with the South Wall and lighthouse, and the mountains of Dublin and Wicklow forming an outline of enchanting beauty in the distance. Marino, the classical seat of the Earl of Charlemont, occupies a delightful situation on the margin of the bay, in the immediate vicinity of the city. The demesne, which the liberality of his lordship has thrown open for the recreation of the respectable citizens of Dublin, is laid out with great taste, and contains an exquisitely proportioned temple, built of white marble, from a design of the late earl, which cannot fail to command the admiration of every visitor. The villages of Clontarf and Dollymount are pleasant little bathing-places, much frequented in the summer months. 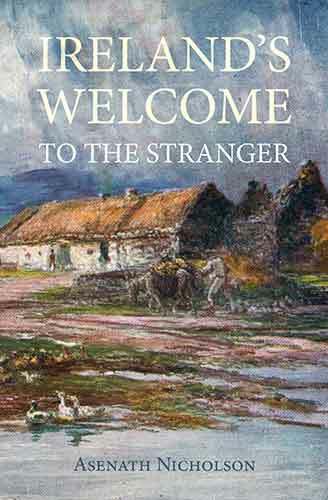 Behind Clontarf, the country, thickly-planted, is intersected by sequestered roads, called "The Green Lanes:"—the appearance from the bay of the long, low, woody shore, studded by detached clusters of white cottages and handsome villas, is remarkably beautiful. The views, both coastwise and inland, as we sweep round the north side of the bay, are singularly attractive; as we approach the promontory of Howth, the shores become bold and rugged, but picturesque. The peninsula, or, as it is usually called, the Hill of Howth, jutting into the sea, forms the northern headland of Dublin Bay, and the little town and harbour, with the CASTLE OF HOWTH, are pleasantly situated under the shelter of the hill which rises precipitously behind them. The town, or more properly the village, consists of one straggling street; the inhabitants are a rude, hardy race, the greater number of them being fishermen, who hold their cabins rent-free, on the ancient tenure of supplying the lord of the manor with the best fish taken in each boat. On entering the town, the first object that arrests the attention of the tourist or traveller, particularly if he be infected with the antiquarian mania, is the ruined abbey, which occupies a romantic site on a cliff overhanging the sea. By the way, although generally called an abbey, the claims of the building to this distinction are dubious: we find no mention of it in the Monasticon, and in early days it was only known as a prebendal church, dedicated to the Virgin Mary. Surrounded by a strong embattled wall, it presents a striking evidence of the half-monk, half-soldier character of its founders, and affords an index of the general state of society at its erection, when it was not unusual, or considered particularly unbecoming, for the professed minister of peace to join in the ranks of war, and distinguish himself in the sanguinary mêlée; or to find the prior or abbot of a monastery, the ostensible temple of religion and the calm retreat of meditation and virtue, marshalling his vassals for the onset, or fortifying his sanctuary by fosse and battlement. 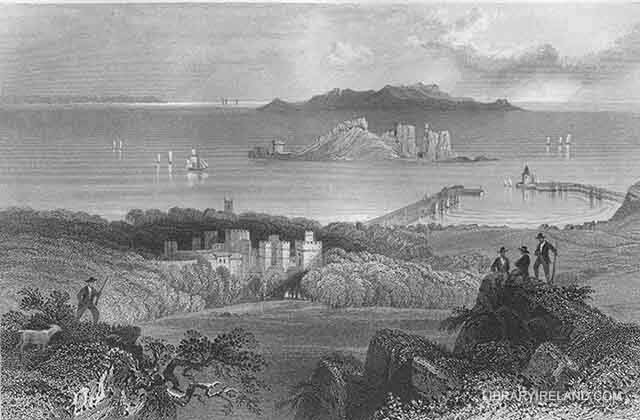 Viewed from a favourable point on the commanding eminence of the hill, the white battlements of the venerable castle are seen emerging from the thick woods in which it is embosomed; lower down, the square tower of Howth Church shows itself above the trees; and beyond these, the harbour and piers, the sea-worn islands of Ireland's Eye and Lambay, and the vast expanse of sea, constantly enlivened by the appearance of ships and boats under sail, form a picture whose features are as varied as they are beautiful and extensive. Howth Castle, the venerable mansion of the ancient family of St. Lawrence, ennobled by the baronial title of Howth, is an object of considerable antiquarian and pictorial interest: the estate which it appears constructed to protect includes the whole romantic peninsula of Howth, and, unlike most Irish estates, has continued in the family, without increase or diminution, for upwards of six centuries. On a steep cliff, at the eastern extremity of the peninsula of Howth, stands the old lighthouse, which has not been used since a new one was erected upon the southern side of the headland, on a small promontory nearly detached from the mainland by a deep ravine, which has obtained, from its constant bright verdure, the name of the Green Bailley, signifying the green town. Here, it is said, the remnant of the Danes who escaped from the battle of Clontarf insulated themselves, by digging a fosse across the neck of the promontory, and defended their little fortress until they were carried off in their vessels.